A route for a road to link South Yorkshire's new airport with the motorway network has been announced. Doncaster Council says it wants the road to Robin Hood Airport to leave junction three of the M18 and pass near Rossington and over the A638. Measures will be taken to try to reduce the noise impact from the airport link road to a minimum. The council will now put its case for the road to the government with the hope that it will be built by 2010. Doncaster's elected mayor Martin Winter said: "An airport link road is a crucial aspect of delivering a successful international airport in Doncaster. "One of the key issues in making the decision on the preferred route is the role the link road will play in opening up the opportunities the airport brings and making sure these developments are available to the borough's residents." 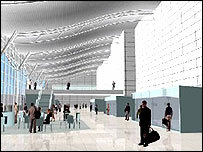 Robin Hood Airport, at the former RAF Finningley, is due to open in the summer of 2005.